Every once in a while something happens that makes you realize that you are doing the right thing. It often comes at a time when you least expect it, but when it does happen, it is amazing and reinforces that all will be right in the world. 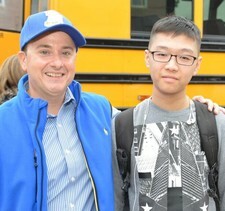 Such an experience recently happened with a wonderful young man named Lionel Li. This story started in November 2006 when I released the book Growing Up With Loukoumi. The children's book teaches kids that if they work hard and believe in themselves, their dreams can come true. In 2008 the book inspired our Loukoumi Dream Day contest where kids record cell phone videos saying what they want to be when they grow up and then we make their dream career come true for a day. Loukoumi dream day winners have watched a spaceship land on Mars from NASA's mission control, cooked with celebrity chefs Cat Cora and Michael Psilakis, visited with MVP Eli Manning and Odell Beckham Jr. at NY Giants training camp, toured the FOX-5 weather center with meteorologist Nick Gregory, visited Rachael Ray on the set of her show, spent a day with the NYPD, sung from the Broadway stage at Rock of Ages with Tony nominee Constantine Maroulis and met their favorite actress, Nathalia Ramos, at Lincoln Center, to name a few. 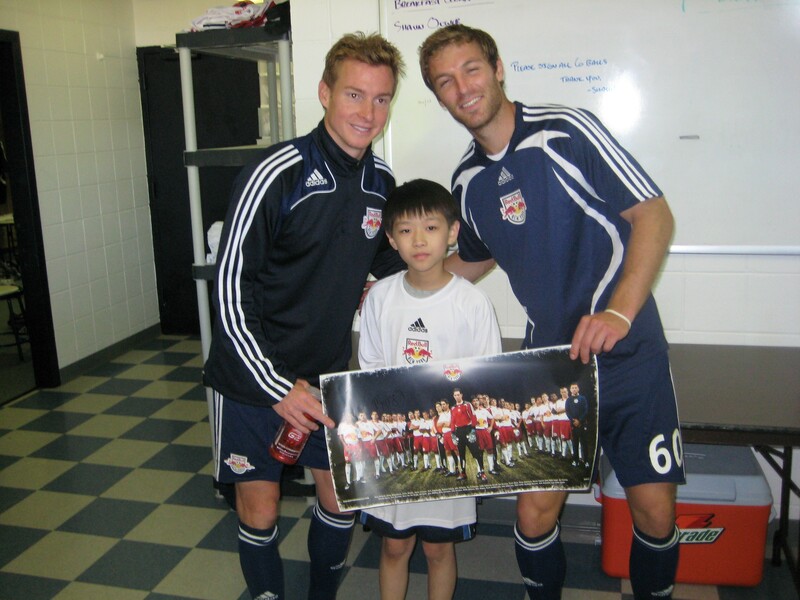 Our very first dream day winner was Lionel Li, a 9 year-old at the time, who wanted to be a professional soccer player. 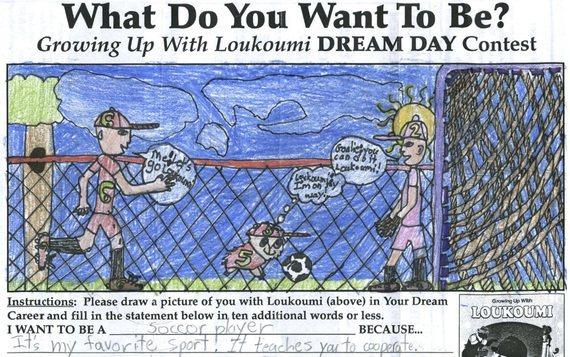 This was before our contest became a video contest and kids had to draw a picture of themselves and Loukoumi in their dream careers. Lionel's beautiful drawing clearly stood out and our judging panel agreed. So I called the NY Red Bulls, New York's professional soccer team, and they graciously agreed to help organize a dream day Lionel would never forget. 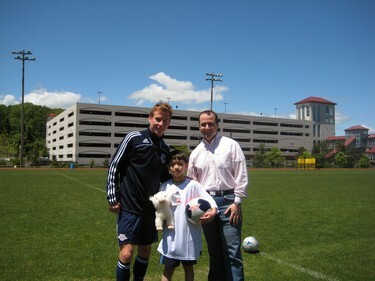 It was a glorious spring day in May 2008 and for his Dream Day Lionel got to play soccer with the Red Bulls at their training facility in New Jersey. He received a private lesson from two of the players, toured the training center and went home with signed memorabilia and memories to last a lifetime. Immediately after Lionel's dream day I boarded a plane to Los Angeles, where we made our next dream day come true (Sophie's NASA experience). While on the plane, I edited the next book in the Loukoumi series, Loukoumi's Good Deeds, which teaches children to do something nice for others. When writing this book, however, never did I expect our aspiring soccer star Lionel to one day do perhaps the greatest good deed of all. After our Loukoumi dream day experience Lionel's family kept in touch via email and attended several Loukoumi book events. Lionel was also one of our original three dream day winners who recorded a special version of Growing Up With Loukoumi with Jennifer Aniston. 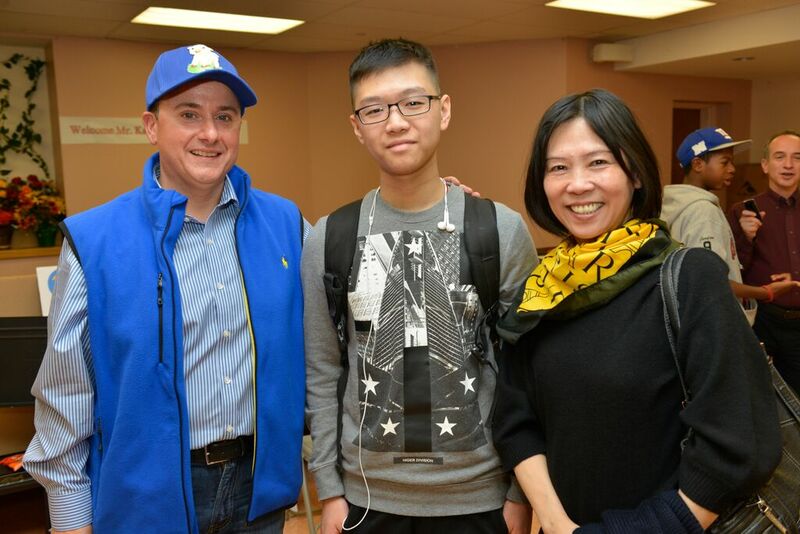 For a couple of years thereafter I lost touch with the Li family. Lionel unfortunately was diagnosed with lymphoma in 2014. He underwent four sessions of chemotherapy and after his final session he was declared cancer free. For a few months the Li family breathed a sigh of relief until they were told in December 2014 that Lionel's cancer had returned. Lionel unfortunately proceeded on a path involving an intense stem cell transplant including high dose chemotherapy and radiation therapy. Lionel's story is a long and hard one, but I am happy to report that today Lionel is healthy. During his treatment, Lionel was contacted by the Make A Wish Foundation, which grants wishes to children with life threatening diseases. Lionel's wish was to visit Disneyland Paris, and so, the Make Wish Foundation was preparing to send Lionel to France. Over the next couple of years, however, because of Lionel's treatment, the trip never occurred. Now that Lionel is better, Make A Wish attempted to schedule the trip again, but what happened next could only be said in Lionel's words. "The entire experience had been a long, enduring and hard journey. I've experienced emotions of sorrow, despair, happiness, guilt, anger, gratitude and many more. The whole incident had opened my eyes to a much wider perspective. My appreciation for family, friends, and essentially life in general is a lot higher. I started cherishing the small things in life; finding joy in daily occurrences, because you never know when they won't be there anymore. It may sound cliché but I try to live each day of my life as if it were my last. I'm so incredibly grateful to have what I have and I wouldn't trade any of it for anything. When I was in three different hospitals, I saw so many children suffering from cancer. Many kids out there may not have similar stories or situations, where it doesn't end with a happy ending. Some families weren't and aren't as fortunate as us to receive financial aid through insurance to pay off the bills. In my opinion, that should be the very last thing a family should have to worry about. A family going through this harsh and cruel experience should not have to think about how they're going to pay to keep their child alive. The thought of helping those children and their families started to form in my mind. 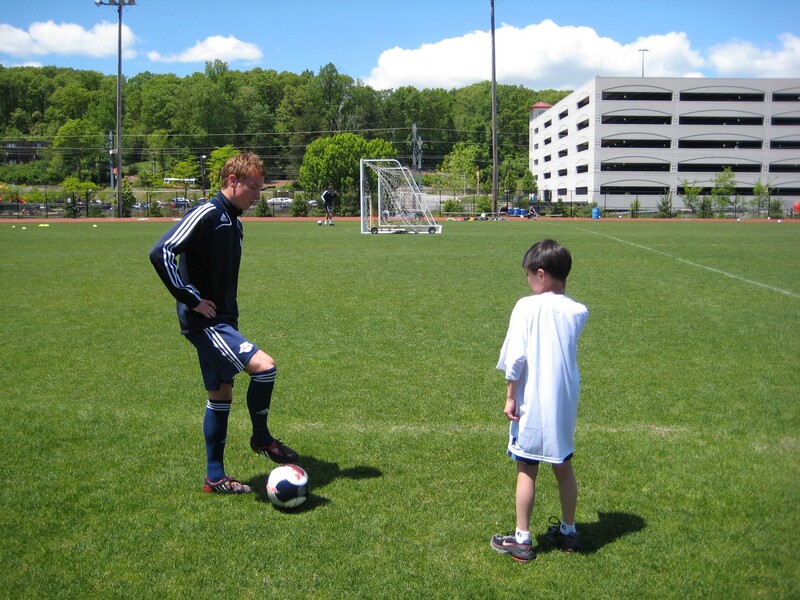 This is why when Make-A-Wish Foundation approached me, I decided to change my wish. I want to raise awareness and help Friends of Karen." Friends of Karen is a charitable organization that provides financial aid to families and children with life threatening illnesses (www.friendsofkaren.org). The organization helped Lionel and his family, which is why he has asked The Make A Wish Foundation, instead of flying him to Disneyland Paris, to donate $10,000 to this wonderful organization...and they did! I learned about this from Lionel's mother, who after telling me the story said that Lionel was inspired by the Loukoumi books and that Loukoumi's message of making a difference was implanted in him from a very young age. This story highlights what Loukoumi is all about. Lionel is an amazing example for other children and adults to follow. His unselfish act is almost incomprehensible, yet a true testament to children everywhere that kindness is contagious. We are so overwhelmed by Lionel's gesture that the Loukoumi Make A Difference Foundation will be honoring Lionel with a Make A Difference Award at our Loukoumi Dance Party and Make A Difference Awards on June 15th (www.LoukoumiFoundation.org). Lionel, we are so proud of you. Thank you for doing the ultimate good deed and for making a difference in the lives of others. Loukoumi's words, "Make someone smile, do a good deed, lend a hand to a friend in need, whatever you do, whatever you say, do something nice for someone today," have never had more meaning. Photos: Top: Lionel's 2008 Loukoumi Dream Day with members of the New York Red Bulls and Nick Katsoris. Bottom: Lionel Li with Nick Katsoris and Lionel's Mom, Chris, on Make A Difference with Loukoumi Day 2015 (photos by Jillian Nelson).